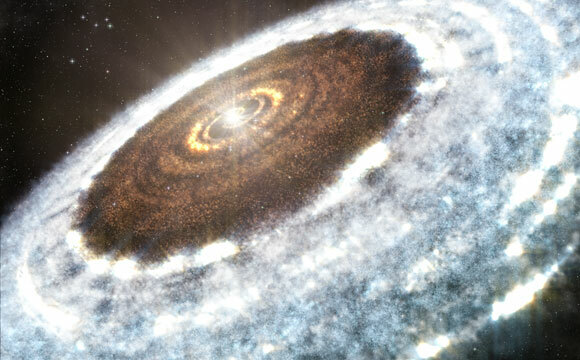 This artist’s impression of the water snowline around the young star V883 Orionis, as detected with ALMA. Using the Atacama Large Millimeter/submillimeter Array (ALMA), a team of astronomers has made the first ever resolved observation of a water snow line within a protoplanetary disc. This line marks where the temperature in the disc surrounding a young star drops sufficiently low for snow to form. A dramatic increase in the brightness of the young star V883 Orionis flash heated the inner portion of the disc, pushing the water snow line out to a far greater distance than is normal for a protostar, and making it possible to observe it for the first time. The results are published in the journal Nature. Young stars are often surrounded by dense, rotating discs of gas and dust, known as protoplanetary discs, from which planets are born. The heat from a typical young solar-type star means that the water within a protoplanetary disc is gaseous up to distances of around 3 au from the star — less than 3 times the average distance between the Earth and the Sun — or around 450 million kilometers. Further out, due to the extremely low pressure, the water molecules transition directly from a gaseous state to form a patina of ice on dust grains and other particles. The region in the protoplanetary disc where water transitions between the gas and solid phases is known as the water snow line. But the star V883 Orionis is unusual. A dramatic increase in its brightness has pushed the water snow line out to a distance of around 40 au (about 6 billion kilometers or roughly the size of the orbit of the dwarf planet Pluto in our Solar System). This huge increase, combined with the resolution of ALMA at long baselines, has allowed a team led by Lucas Cieza (Millennium ALMA Disk Nucleus and Universidad Diego Portales, Santiago, Chile) to make the first ever resolved observations of a water snow line in a protoplanetary disc. The sudden brightening that V883 Orionis experienced is an example of what occurs when large amounts of material from the disc surrounding a young star fall onto its surface. V883 Orionis is only 30% more massive than the Sun, but thanks to the outburst it is experiencing, it is currently a staggering 400 times more luminous — and much hotter. This image of the planet-forming disc around the young star V883 Orionis was obtained by ALMA in long-baseline mode. This star is currently in outburst, which has pushed the water snow line further from the star and allowed it to be detected for the first time. The bizarre idea of snow orbiting in space is fundamental to planet formation. The presence of water ice regulates the efficiency of the coagulation of dust grains — the first step in planet formation. Within the snow line, where water is vaporized, smaller, rocky planets like our own are believed to form. Outside the water snow line, the presence of water ice allows the rapid formation of cosmic snowballs, which eventually go on to form massive gaseous planets such as Jupiter. 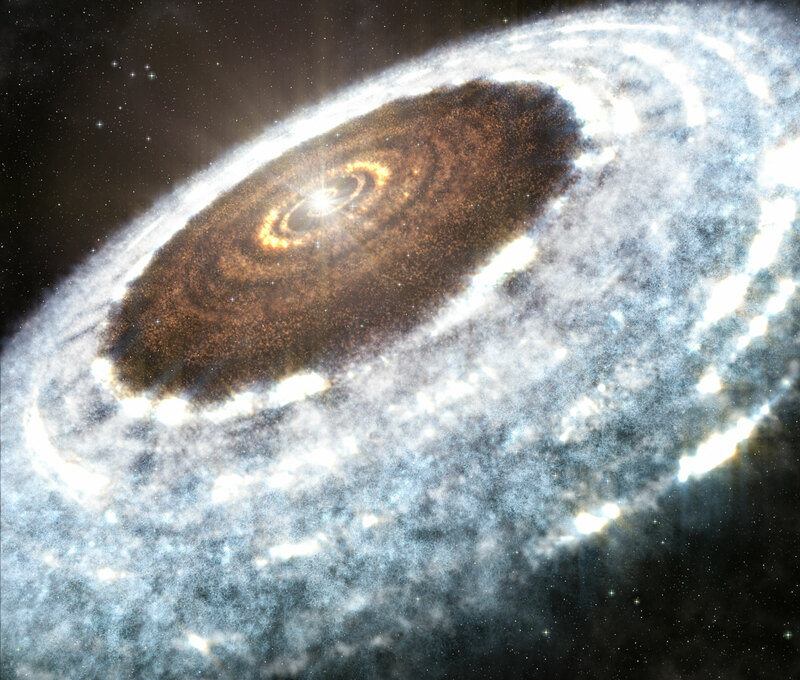 The discovery that these outbursts may blast the water snow line to about 10 times its typical radius is very significant for the development of good planetary formation models. Such outbursts are believed to be a stage in the evolution of most planetary systems, so this may be the first observation of a common occurrence. In that case, this observation from ALMA could contribute significantly to a better understanding of how planets throughout the Universe formed and evolved. Be the first to comment on "ALMA Detects Water Snowline Around Young Star V883 Orionis"